San Francisco, CA (GLOBE NEWSWIRE) - KETOS, a water intelligence innovator, today announced it has closed a $9 million Series A round of financing from a powerful collection of traditional venture capitalists, impact investors and industry leaders. New investors Broadway Angels and Plum Alley Ventures, as well as strategic angels from water.org, the semiconductor industry and an investor represented by Energy Innovation joined existing investors Rethink Impact and Better Ventures in the round. Offering the first comprehensive water intelligence platform, KETOS will use the funding to expand its team and drive the emergence of a new era of water efficiency and safety. “Clean, safe water is essential. However, a host of activities—including fracking, mining, landfills, pollution, runoff, excess pesticides and fertilizers—are potential dangers to our water resources. Leapfrogging the incomplete and fragmented water testing and monitoring technologies of the past, KETOS will help ensure we can meet water safety needs and standards,” stated Hal Harvey, CEO of Energy Innovation, an energy and environmental policy firm. Led by CEO Meena Sankaran, an accomplished technology executive and business leader, KETOS is building a safer, more efficient water management system by delivering actionable, real-time water monitoring and analytics. With this funding, KETOS will accelerate global market penetration of its award-winning, patented sensors and machine-learning analytics platform purpose-built for mission-critical applications across water-intensive sectors. KETOS Shield Fabric offers the most innovative real-time water safety management solution with an advanced warning system that flags an extensive list of contaminants and heavy-metal toxins to ensure water quality and safety. 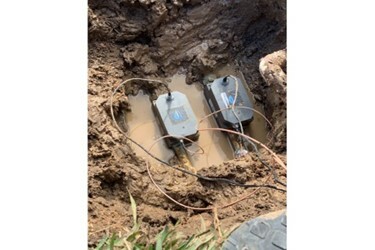 It also gives operators insight on the best filtration or remediation action, how to help manage crop yields efficiently or take cost-effective measures for process control, and prompts users to proactively repair pipes at the appropriate times based on its predictive maintenance capabilities, delivering significant operational savings. KETOS Wave Fabric delivers real-time water utilization data, leak detection and remote water supply management – all from innovative software fabric housed inline within the pipe. KETOS Wave also offers a deeper understanding of consumer behavior, predictive insights on water distribution and physical parameters of water like flow and pressure, as well as utilization forecasts for operators to have robust water grid management. The KETOS water intelligence platform can detect 20+ parameters as direct measurements at precision levels expected in labs and has analyzed over one million water quality tests across more than one million gallons of water with 130+ deployments in India, Mexico and the United States. KETOS empowers its users to improve water management and take action in real time to reduce costs, minimize leaks and ensure water quality. In initial deployments, KETOS drastically reduced water-testing costs – saving millions of dollars per water treatment plant and reducing the cost of water sample testing by 90 percent – while providing accurate, real-time monitoring for lead, copper, nitrates, arsenic, chlorine, and more. Energy Innovation’s Veery Maxwell will join Rethink Impact’s Heidi Patel on the KETOS Board to help the company aggressively scale. KETOS serves an array of industrial and agricultural enterprises, commercial businesses, and institutions for which water plays a critical role. Learn more about KETOS and its effective smart water management solutions here. KETOS provides the tools and insights needed to optimize water usage, ensure resource efficiency and provide water safety assurance – all via affordable and accessible tools. Its innovative, patented hardware and intelligent, interactive software fabric provides predictive and actionable metrics through data analytics – delivering the water intelligence needed for smart irrigation, industries and cities. Learn more at www.ketos.co.